Android app development is taking over iPhone and will soon go wild. However, the app development process is not as well defined as app development for Windows desktop yet. Though, this is sure to change once we see a sway of developers towards Android. Irontec, a Spanish startup specializing in Linux Systems, is the company behind PHP for Android. The PHP port comes with a very user-friendly documentation, which can help fire up the jets for developers. 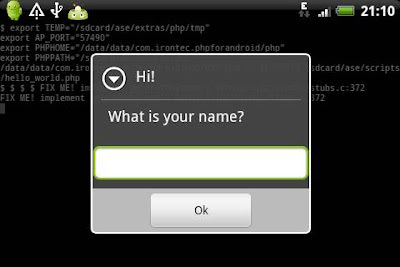 PHP for Android makes use of the Android Scripting Environment project, which is maintained by Google itself. This adds support for executing scripts directly on the Android device using a native interpreter. Android is one of the iPhone application.This is one of the pleasurable post.I like your blog tips. Impressed!! This is little new to know that PHP for Android App Development. Informative article! !